Before we begin, a quick housekeeping query: is everyone sufficiently bucked up and ready for further old-school 1970s (or 1980s, depending on whom you ask) sci-fi escapades? Wonderful. Perhaps emboldened by the success of their Dalek revival in Volume 3, Big Finish isn’t skimping in the slightest on classic villains in their newest pair of Adventures for the Third Doctor. In fact, they’ve introduced not one but two returning antagonists into the fray for Volume 4 in the forms of the Meddling Monk and – for the first time ever in a Jon Pertwee-era tale, so better late than never – the Cybermen. Admittedly this reviewer took umbrage with how intent “The Conquest of Far” seemed with simply reliving Dalek glory days, rather than seeking to develop how we perceive Skaro’s finest in any notable way, last time around. Will Guy Adams and Marc Platt’s next efforts to immortalise the late Pertwee’s beloved Doctor – now revitalised via Tim Treloar’s loving aural homage – fall into the same traps, then, or can their connective thematic tissue surrounding the ever-complexifying concept of human nature elevate proceedings? Had we ever told diehard fans of all things Doctor Who after watching the divisive “The Woman Who Lived” in 2015 that supporting star Rufus Hound would go on to resurrect a long-overlooked classic antagonist to tremendous acclaim, the best case scenario, most would have justifiably scoffed in our faces. Between his infrequent appearances in the Short Trips and Doom Coalition ranges along with the British comedian’s headline role in Volume 4’s opening tale, however, that’s all changed and the results could hardly feel more satisfying than in the case of “The Rise of the New Humans”. A whirlwind four-parter that’s by parts thought-provoking, hilarious – as if we’d expect anything less of Hound – and thrilling, “Rise” fits into the mold of the Third Doctor era perfectly, posing a fascinating metaphysical concept as human test subjects find themselves transformed into supernatural beings capable of withstanding nearly any affliction. Naturally, though, Doctor Who wouldn’t be Doctor Who without an audacious experiment gone wrong, and sure enough the side effects – not to mention the technology recklessly co-opted by the Monk to achieve his not-so-altruistic goal – quickly lead listeners and the major players alike to question the limits of science’s oft-perceived god complex. If this all sounds too grim and sombre an affair to warrant the Monk’s involvement, then rest assured that Hound alleviates any such concerns with unmistakable ease from the outset. It’s thanks to his sinister, almost sickly, charisma and brilliantly earnest haplessness in the face of just about any danger that Adams’ borderline gothic – certainly Frankenstein-esque – script never gets too bogged down in its contemplations on evolution and the increasing risks of intervention in this natural process for financial gain, with the Monk’s attempts to disguise his seemingly benevolent intentions so delightfully inept that the audience should barely mind sitting through the humour-laden first half before discovering his true ambitions. At the same time, though, Adams thankfully also realises the supreme value and drawing power that Tim Treloar and Katy Manning both hold in the eyes of the Adventures range’s fandom, peppering in a wealth of understated conversations between the pair which perfectly encapsulate their bubbly, at times teacher-student-style dynamic. Whether they’re arguing over Bessie’s temperamentality on a rain-swept road – a subtle homage to The Rocky Horror Picture Show, perhaps? – or the Doctor’s comforting Jo upon her poignant realisation that rumours of us only accessing 10% of our brain power may have been exaggerated, every exchange that the characters share could’ve been ripped straight out of a 1970s serial, with Treloar’s righteously confident and Manning’s sweetly innocent line deliveries both as completely pitch-perfect as ever. The only noteworthy misstep on the wright in question’s part, then, comes with Part 4. While by no means a deal-breaker, the final installment of “Rise” does succumb to an all-too-familiar virus plaguing myriad audio and TV Who adventures – hightailing it to the finish line and ditching any intriguing ideas laid along the way in the process. One can’t help but notice the superior running time afforded to the boxset’s second story – the individual episodes of which run for around 30-35 minutes each compared to this serial’s 20-25 – and wonder if Adams struggled to give ideas like humans struggling with their deadly mutations full due, hence the final 25 minutes descending into the usual catastrophic monster mash and retconning a hugely tantalising cliffhanger regarding Jo within moments of its occurrence. Maybe Adams simply needs to keep honing his stabs at the four-part format instead, but it’s food for thought in terms of whether he might better befit a five- or six-episode serial should he contribute another script for the recently-announced Volume 5. Reading the above lines of dialogue alone will, for many fans, surely prove a cathartic experience in and of itself. After all, despite coming into contact with Daleks, Silurians, Sea Devils, Sontarans, Ice Warriors and Autons over the course of his four-year tenure, not to mention the Master on a near-weekly basis, Jon Pertwee’s Doctor never earned himself the chance to battle arguably Doctor Who’s second most iconic monster, joining Paul McGann, John Hurt and Christopher Eccleston’s as the only such incarnations faced with this unspeakable on-screen plight. But, as Hurt’s War Doctor proclaimed in 2013’s similarly Cyber-lite 50th anniversary special “The Day of the Doctor”, no more. Setting down on an initially near-deserted human colony dubbed Burnt Salt, the now exile-free Time Lord and Jo soon discover that they’re far from alone; quite to the contrary, a nearby saloon houses a wild assortment of rogues and ex-soldiers, all of whom bear a secret inevitably doomed to surface as the Cybermen make their presence on Burnt Salt known with their destructive efforts to secure a vital hidden weapon. Prior to us proceeding any further, though, a word of warning – with its Cybermats, Cyber Wars fallout and attempted Time Lord-Cyber conversions, Marc Platt’s latest script represents a quintessential story for everyone’s favourite Mondas residents, for better and for worse. Unless this boxset somehow marks your first encounter with Who, many of the twists in “Logic” will likely seem rather familiar; from characters mistakenly willing to sacrifice their humanity to the robotic menaces escaping supposed extinction yet again, from the Doctor needing 10 minutes to alleviate his companion’s dismay at their latest foe’s near-human nature to Part 4’s predictable final duke-out, there’s nothing particularly fresh to speak of in what’s a fairly run-of-the-mill nostalgia tour. Nothing, that is, save for the continuing thematic strand surrounding what it truly means to call oneself a member of the human race. If “Rise” explores this existential concept through a metaphysical exploration of our species’ DNA being evolved to a supposed higher state, then “Tyrants” – as with many Cyber-tales, although to more emotional effect a la Spare Parts – does so by presenting members of our species on the brink of having every aspect of their personalities stripped away. Can we possibly still define someone as human when they’re clinging to any remains vestiges of their Id / ego / super-ego? Sure, it’s a line of inquiry also recently pursued by TV serials like “Asylum of the Daleks”, but without spoiling too much, Carolyn Pickles achieves wonders as her character Marian Shaeffer’s cold exterior peels back to reveal her heartbreaking motivations in this regard. Indeed, even if “Logic” doesn’t exactly break a great deal of new ground compared to a recent TV Cyber-outing like “World Enough and Time / The Doctor Falls”, it’s not for want of the central and supporting cast alike doing their utmost – with director 17021’ support and guidance, no doubt – to provide an entertaining 2-hours of pseudo-base-under-siege action. That Treloar and Manning’s insatiably endearing chemistry injects humour and charm at every turn likely goes without saying at this point, but look out too for Briggs’ finest turn yet as the ever-hauntingly impassive invaders standing in Burnt Salt’s doorway as well as a contrastingly vulnerable performance from Deli Segal’s Skippa, another innocent bystander caught in the crossfire of a seemingly unyielding, constantly destructive conflict. Above all, this stellar new boxset for Treloar’s Third Doctor marks a vast improvement on Volume 3, offering a far more consistent pair of serials that seldom cease to provide gripping listening no matter your chosen venue of aural consumption. Does “Logic” still follow the roadmap presented by Cyber-tales gone by a little too rigidly at times? Sure, but its stirring explorations of warped human psyches – combined with Adams’ own study in “Rise” of our dangerous strides towards godhood of late – ensure that it’s nonetheless a far superior beast to “Conquest of Far”, particularly with Briggs taking such unnerving pride in chronicling Pertwee / Treloar’s proper first encounter with the Cybermen. 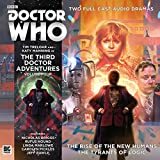 This reviewer has spoken before on the matter of whether Big Finish’s abundant New Series productions – see Tales from New Earth, The Churchill Years Volume 2, Gallifrey: Time War and The Diary of River Song Series 3 in 2018’s opening quarter alone – threaten to overshadow their Classic Series output if they’re not careful. Provided that the studio keeps producing such captivating jaunts into the lives of Doctors past, though, then their listeners, stars, scribes and directors should have nothing to worry about in terms of the job security that Hartnell-McGann’s incarnations will maintain going forward. And buck down…see you next year for Volume 5 at the same Bessie-time, same Bessie-place!